If it feels like everyone you know has gotten engaged in the last three months, that’s probably because they have. According to wedding technology company WeddingWire, nearly forty percent of engagements occur between Thanksgiving and Valentine’s Day. If it feels like everyone you know has gotten engaged in the last three months, that’s probably because they have. According to wedding technology company WeddingWire, nearly forty percent of engagements occur between Thanksgiving and Valentine’s Day. And while there are endless ways to show your loved one how much you care this Valentine’s Day, nothing says “I love you” quite like a gorgeous custom engagement ring. Every love story is as unique as the two people behind it, finding a ring that tells that story is just as important. 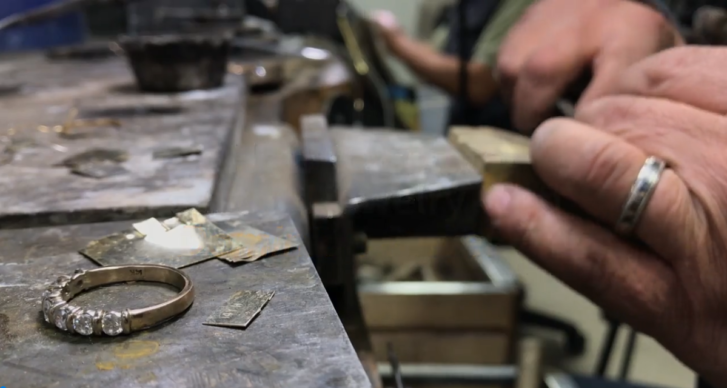 The process of creating a custom engagement ring with Dominion Jewelers is truly a bespoke process, meaning that every part of the process can be customized. The most important part begins with you! Bringing your jewelry ideas to life begins with knowing your options. With so many resources available online, research is incredibly important. Think about what defines your partner’s style, what jewelry they often wear, what they like and what defines your own unique love story. Is it more traditional? Trendy? Classic? Timeless. Dominion Jewelers often recommends bringing visuals like pictures to the first consultation. Styling consultants are trained to help you uncover every possible option and turn your ideas into the perfect design. Once you have the general design, then come the details. What metals should be used, which stones and how many? An initial sketch is drawn to fine-tune these important features. From the sketch, a computer-assisted design (CAD) is created as a model to give a visual interpretation of what your bespoke jewelry will look like. And from there the process is turn-key. The jewelers at Dominion have years of experience and specialize in all aspects of jewelry creation from casting and setting to soldering, sanding and polishing. The jewelers take a shell and from it, create a work of art. You may be asking yourself, great, now what’s the pricetag? The truth is, it varies. When creating a work of art, cost is always a consideration however working with various types of stones, sizes of stones and metals allows you to create the perfect combination all while staying in reach of your budget. At the end of the day, the goal is to create something individual just for you based on your specific needs!